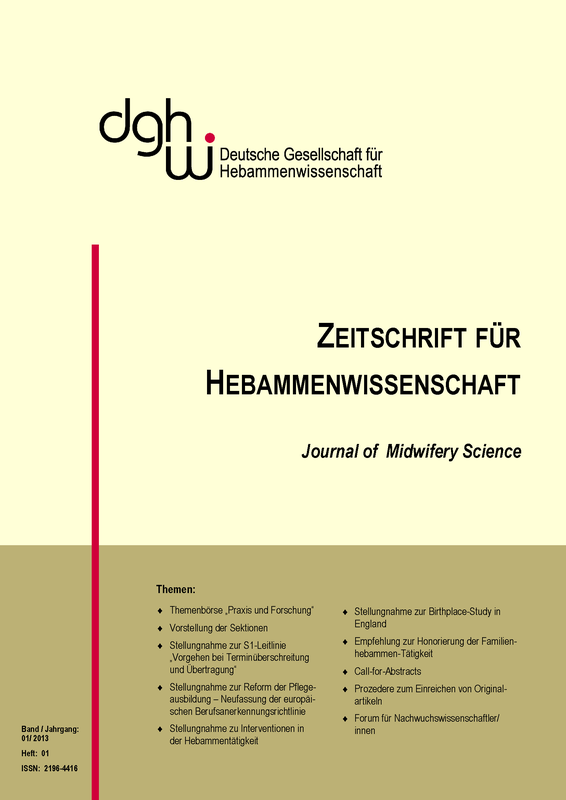 The Journal of Midwifery Science (Zeitschrift für Hebammenwissenschaft) is the publication of the German Society of Midwifery Science (Deutsche Gesellschaft für Hebammenwissenschaft e.V. ; DGHWi) in which, in addition to original articles on theory, research or subjects relevant to practice, official evidence-based position statements of the Society are printed. The contributions appear in German or English with abstracts in both languages. To enable unrestricted access to the original articles of the print edition, an open access edition of the Journal of Midwifery Science (ISSN 2196-4416) is available online on the German Medical Science platform: GMS Journal of Midwifery Science (GMS Zeitschrift für Hebammenwissenschaft) (ISSN 2366-5076).